All web sites should start with a well-defined web plan, just as every business should have a business plan. Creating a web plan can be as general or specific as the need. A web site can't be all things to all people, so don't try. A plan can be a simple single page or a complex document that outlines every detail. You need one for both new web sites and renovations to pre-existing sites. Step 1: Pick some very specific goals, like: who do we want to reach, what do they need to know about us, our products or services, and how do we keep their interest over time? Step 2: Define the scope of your web project and identify the technologies you will need, who will be responsible for implementation and maintenance, and make a list of priorities so that "scope creep" is less likely to increase your costs. Step 3: Set a budget and a timeline, select a web designer or design team that has the capabilities to meet your goals and who will be easy to work with. There are lots of stories about a great start but a sad finish in the web world. Step 4: Provide compelling content. You can offer whitepapers and downloads, but don't fill your pages with information. Be brief to keep your visitors interested. If you aren't capable of providing great content hire a content professional. Step 5: Revisit your web site every 6 months if possible and use metric feedback to tell you what is working and what is not. Revise, revise and keep on revising as your market and other conditions change. Let me help you save time, money and effort by assisting you with your web plan. Contact me. 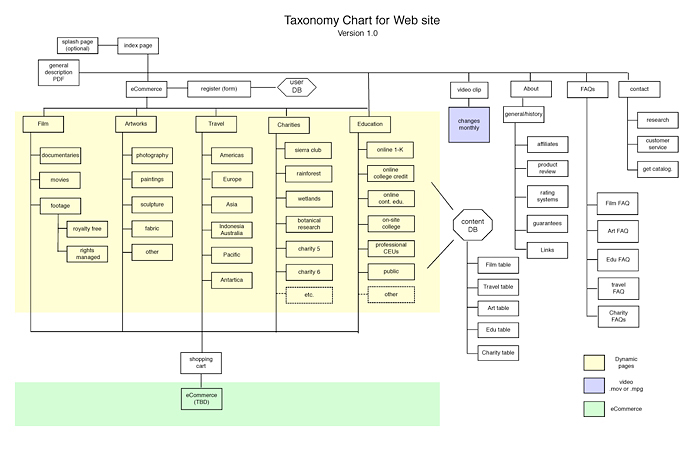 This is a site taxonomy – a visual depiction of how your site will be organized, showing you the expected scope or size of the site. It will also describe how the site will function, show login pages, databases, ecommerce sections and more. A web plan and taxonomy are the the first things that need to be completed before a single page is designed. It keeps both you and the designer on track and it is also a great tool for determining the wide variety of content you may need. 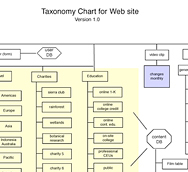 Typical taxonomy chart for a web site.